Taking The Charge Podcast Episode 236: We take a quick look at the NCAA Tournament and some hoops in Bavaria. 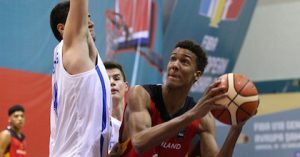 And then there is an interview with German 1998-born talent Louis Olinde of Brose Bamberg. Episode 236: A brief look at the NCAA Tournament and hoops in Germany – also including U16 JBBL and U19 NBBL games and Brose Bamberg losing to Bayern Munich and Baskonia.